Where are your offices currently located? We currently have own offices in Belgium, Ghana and Ivory Coast which are all part of the COMEXAS Group. 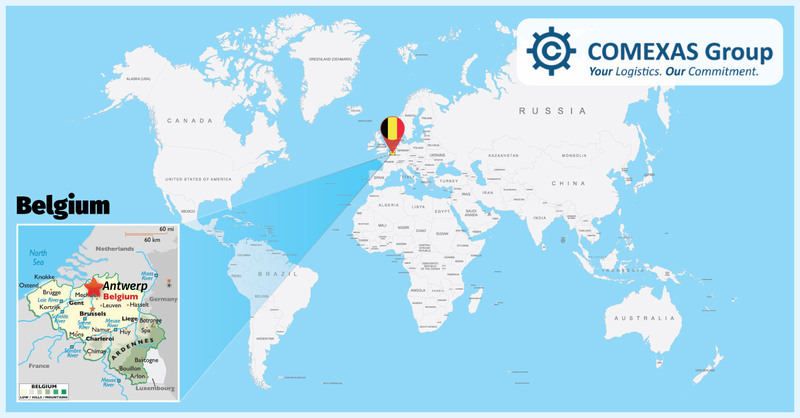 In Belgium we have 2 offices: ‘COMEXAS Seafreight’ located in Antwerp and ‘COMEXAS Airfreight’ at the Brussels Airport both offering general & project cargo forwarding. The COMEXAS Ghana offices are located in Accra (airfreight forwarding), Tema (seafreight forwarding, warehousing, transport, shipping) and Takoradi (seafreight forwarding, warehousing, transport, shipping). In Takoradi, ‘COMEXAS Oil & Gas’ was launched in 2016, fully dedicated for logistical services to the local Oil & Gas industry. ‘COMEXAS Côte d’Ivoire’ in Abidjan started its activities in 2017. Previous offices in South Africa (COMEXAS South Africa) and DRC (COMEXAS Afrique) were sold through MBO’s to former associates. With those entities we keep the same strong operational and commercial ties. The ‘COMEXAS Afrique’ DRC entity is even still operating under COMEXAS’ identity. Are you used to handling project cargo? if so, could you provide us with some examples that you have handled in recent times? We handle project cargo in all shapes, sizes and weights from anywhere to anywhere! Africa is an interesting market indeed. I’d like to ask for a bit about history so that our readers can understand why Belgian companies are often involved in African logistics. Has Belgium had colonies in Africa and what is the main reason for this relationship? Is Antwerp’s status as a world-famous hub for African shipping a factor? Indeed, Belgium had a colony in Africa, claimed first by King Leopold II as his personal property in 1885 with the support of other European countries. It was named the ‘Congo Free State’. After a lot of reports of atrocities committed under his rule, the colony was seized from Leopold II by the Belgian state and renamed the ‘Belgian Congo’ from 1908 to 1960. It was renamed ‘Zaire’ by Mobutu in 1971 and is known today as the Democratic Republic of Congo. In order to serve the needs of of passengers, cargo and mail to and from the colony, the first liner services between Antwerp and Congo were established in 1895 by the British owned CBMC ‘Compagnie Belge Maritime du Congo’ and the German owned SMC ‘Société Maritime du Congo’, with both providing a monthly liner service. SMC discontinued their service and the CMBC was taken over by Belgian shareholders in 1911. From 1927 onwards, the CBMC started calling other African ports and was then renamed in 1930 to the better known CMB ‘Compagnie Maritime Belge’ which still exists today despite the liner activities being sold in 1996 to Safmarine. This history is definitely part of the reason why the port of Antwerp is still so heavily involved in trade to/from continental Africa and continues to offer an enormous amount of possibilities for shippers. In the break bulk/project cargo sectors especially, there is quite the choice of liner services to the various African ports. As a result, cargo originating from ports where these direct services are nonexistent is often transshipped in Antwerp. This is a service COMEXAS Seafreight will gladly assist its partners and clients with, in order to find suitable connecting shipment solutions to the African continent. Not only is the port of Antwerp known for its African connections, the port is especially known for its break bulk and project cargo handling capabilities and possibilities. Are you currently a member of any freight forwarding networks? If so, why? COMEXAS Seafreight is a member of the CLC Projects network, a dynamic project cargo network as well as IFA network, a general cargo forwarding network. Regarding our daily cross-trade and often complex door to door operations worldwide, we must have reliable partners at various origins and destinations to complement our own network. This is crucial for COMEXAS to able to successfully offer requested cargo movements at competitive prices, combined with the excellent service levels our clients expect from us. This is especially the case for project cargo shipments, but also for general cargo shipments that often have to be delivered to very remote places within certain time constraints. Are there other markets in the world where COMEXAS Group is active? Although our main focus remains on the various general/project cargo shipments to/from the African continent, we do successfully offer our services to/from worldwide destinations and do so every day for our diverse client base. What is the general opinion in Belgium about Brexit and Britain likely leaving the European Union? It seems to many Europeans, myself included, that the British public were not correctly informed of the true consequences of leaving the EU during the referendum campaign. In my own opinion, such an important decision, which I’m sure will hurt both the UK and EU economies if it does go through, should not have been made by referendum. Those wanting change will always be more motivated to actually cast their vote in such a referendum, I think. Everyone in Belgium (as with the rest of world) is now wondering if and how Brexit will finally be concluded. It seems like a never-ending saga, leaving everyone guessing what the UK really wants now. With the UK parliament having voted twice against the deal on the table (and thank God Theresa May was saved further embarrassment by not being granted a third vote), it seems the UK is as divided as it can possibly be on Brexit, with no real prospect of the possible approval of a negotiated deal on the table. It would not surprise me if the expected approval in extending the Brexit deadline will eventually lead to the UK’s withdrawal of the article 50 procedure. For Belgium and, in particular, the Flanders region, the Brexit outcome is of huge economic importance considering the large trade volumes between both our countries. Close to nine percent of Belgium’s yearly export goes to the UK, of which eighty percent originates from the Flanders region. Meanwhile, Belgian customs have sent out 20,000 letters to Belgian companies trading with the UK and not registered in the customs EORI database with explanations on how to prepare themselves in the case of a ‘hard’ Brexit. Belgian customs are also preparing as best they can but currently have nowhere near enough personnel to handle the potential consequences of a hard Brexit. A preview of these consequences can currently be witnessed in France for those travelling by Eurostar to London with the recent customs strikes. It’s not an appealing scenario if you ask me! How did you first get into shipping Alexis? I got into shipping by chance really. Freshly graduated from university, I had no clue what I wanted to do with my economics degree apart from the knowledge that I wanted a challenging and diverse, internationally-oriented job. I received a job proposal from COMEXAS Seafreight after a successful interview. Thinking back about that day, I remember that I didn’t even know what a bill of lading was during the interview 😊. Now here I am, still working for the COMEXAS Group seven and a half years later, three of which I’ve spent working for COMEXAS abroad at our Ghana offices. I can say that I haven’t regretted my decision for a single moment! It’s said, and with some truth, that Belgium has the best French food, beer, wines and chocolate. But Belgium also has some nice tourist spots that people might not know of. Could you tell our readers about scenic spots or places in Belgium that you would recommend they visit? I would say that your assumptions about Belgium having the best food, beers and chocolate are one hundred percent correct! But let’s not forget, Belgium has the best ‘French fries’ as well. However, we will leave the good reputation of the wines to our French neighbors! Being from Antwerp, I can only recommend visiting my home town, where everything is quite concentrated and there is always something happening. BA stroll through the neighborhood ‘Eilandje’ (read: ‘Little Island’), situated between the city and the port at the ‘Scheldt’ river, cannot be missed when visiting Antwerp. It is the oldest port area in Antwerp and has seen significant investments over the past two decades. The neighborhood is home to the MAS, a museum that offers an amazing view of the city from the roof and the port house, designed by Zaha Hadid, where the Antwerp Port Authority is located. You can send me an email at a.mellen@COMEXASgroup.com or feel free to give me a call on my office number +32 3 360 97 82.